Just like fashion, beauty trends change with every season. “Undone” hair, embellished nails, anti-aging body treatments, voluminous lashes and metallic makeup are just a few of the trends that brides-to-be are embracing. But whether you go contemporary cool or classic chic on your wedding day, the state’s hottest beauty pros have some tips and tricks to ensure your big-day beauty is stress-free and utterly stunning. 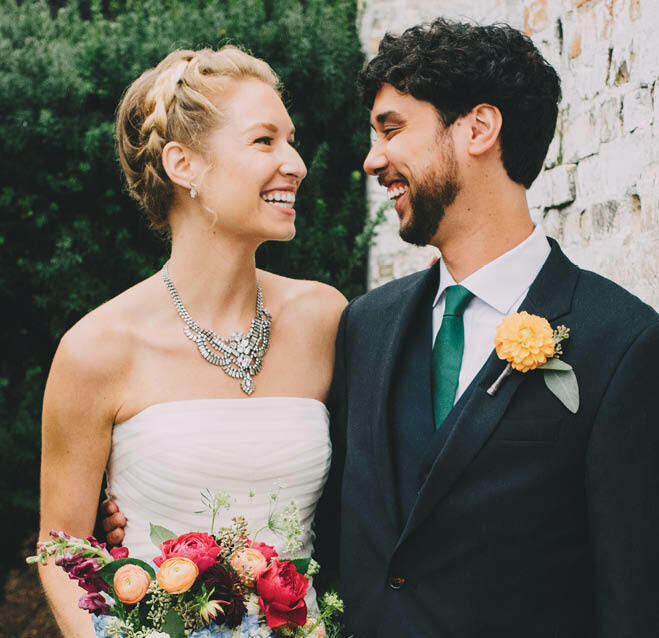 According to Scott Yance, owner of Milwaukee’s Scottfree Salon and a New York Fashion Week hair stylist, today’s wedding hair is simply softer, and almost a bit unkempt. Brides are looking for an element of texture, be it a twist or knot or braid. “Buns, ponytails and any other focal points are kept lower,” he adds. “All of this contributes to a softer, more romantic look.” Boho braids, floating florals and unfinished waves all saw a place on the bridal runways, and have caught the attention of brides-to-be. In fact, Yance is seeing many clients bring in inspiration images of these hot trends during their initial consultations. Yance’s No. 1 tip for stunning bridal hair? Take your vitamins. “Biotin is absolutely essential for strong and healthy hair and nails. Everyone should be taking it daily—not just brides.” And to keep your gorgeous hairstyle intact all day long, Yance tells his clients to keep a few key items nearby: hairspray, a comb, extra bobby pins and a static guard, such as Kérastase Carré Lissant smoothing sheets. When it comes to inspiration for wedding-day nails, the sky’s the limit. “A bride can bring anything she wants, such as an item that ties in with her wedding colors or maybe even a sample piece of fabric from her dress,” says Lisa Nelson, nail designer at Neroli Salon & Spa, with locations in Milwaukee, Brookfield, Mequon and Glendale. For 2016, Nelson is seeing brides opt for pastel and sheer pinks and nudes, light gray, white and taupe nail colors. Brides are also including their “something blue” in their nails, with either a royal or pastel blue. These can be paired with a subtle glitter ombré fading from the cuticle toward the tip of the nail. French manicures are still prevalent, and for a trendy twist, brides are adding a thin silver or gold line between the white tip and pink base. But according to Nelson, lace is her most requested design. Whether you opt for traditional pink or a trendy embellished design, nails should never be an afterthought. (Just think of those wedding-day photos of your ring!) In fact, Nelson recommends visiting a nail designer two to three months before your wedding day for a consultation. “Once your nails are manicured, brides should avoid doing strenuous things with their hands, such as heavy lifting, cleaning or doing dishes,” advises Nelson. Gel polishes, like OPI GelColor, are popular, since they dry instantly and last up to 14 days. If you prefer a traditional polish, Nelson recommends Zoya nail polish, which offers a “color lock” system that helps prevent chipping. To ensure nails stay in tip-top shape, she also encourages brides to create a nail emergency kit, including polishes that match your nail color, a clear top-coat, nail glue and hand lotion. After all, you can never be too careful. It all starts with planning. Leon suggests coming in for a consultation three to six months before your big day; that way, your beauty professional has a chance to evaluate your skin and get you started on a personalized skin regimen. Make sure to bring inspiration images to your consultation as well. This season, Leon is seeing bold bridal makeup choices. A bright red lip, stunning metallic highlights or a strong cat-eye liner are some of the most requested makeup designs for 2016. Leon also suggests requesting a makeup artist who is proficient at airbrush makeup. Airbrush makeup is lightweight but durable, and goes a long way to help create a flawless face. Grober-Beschta suggests brides come in two weeks before their wedding for an application of a full set of lashes (allow for about two hours), and again the week of the wedding for a lash fill. This allows the technicians to make lashes as full as possible for the big day. Speaking of fullness, Grober-Beschta says the biggest trend in lash extensions is “volume lashing,” a process where lash technicians use finer extensions to build a fluttery, voluminous look at the lash line. Whether you’re going for volume, length or both, the maintenance is always the same: “Lash extensions like to be clean, dry and left alone,” says Grober-Beschta, adding that most guests stop by for lash fills every two to three weeks to ensure full and vibrant lashes. “It’s so important for brides to de-stress so they can be open to all the joy that comes with the big day,” says Courtney Syverson, spa director at Sundara Inn & Spa in Wisconsin Dells. “Brides tell us all the time that it’s nearly 100 percent stress leading up to the wedding, and they want to be fully ‘in the moment’ when it comes to their ‘I do’s.’ ” To that end, Syverson suggests brides indulge in treatments to both relax the body and clear the mind. But let’s start with the face. According to Syverson, for facials, brides can choose one of two directions. If stress relief and centering is the bride’s highest priority, select a facial that is calming (and might even allow for napping or meditation). If you’re looking for visible skin care results, try a facial that will plump the skin, smooth the texture and enhance luminosity, like Sundara’s Peptide Power Lift Facial. Peptides function as moisture-binding agents and help the skin repair itself. For body treatments, a firming wrap is an ideal choice, as it releases toxins, improves the tone and texture of the skin and increases circulation. While anti-aging facials are very well established, in 2016, brides are also opting for anti-aging treatments for the body (like Sundara’s Peptide-Rich Body Treatment). Another trend brides are embracing is the full spa immersion, enjoying back-to-back treatments in a suite-like room.